Congratulations on taking the first step to making smart financial decisions. You'll get a custom report on your finances and where the problems are, and how you can benefit from fixing them. The link above will send you an email that will allow you to get started on your fact finder. You can save and continue your fact finder at any stage. In order for us to create you a GeekPeek, we need to know about your financial life; studies show that the better the information that goes into a financial strategy the better the resulting strategy will be. We like our strategies to be the best, so we need good information. We ask certain questions that may not seem relevant to you, however the financial system that we are working within is complex and all the answers you provide fit together like pieces of a puzzle. And best of all it's totally free, no-obligation and you can even keep the report if you want. 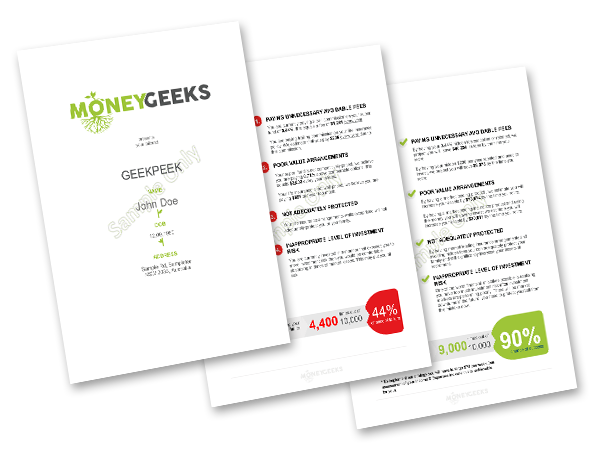 If you are confused by anything in the fact finder just get in touch with us at info@moneygeeks.com.au. It's much better to clarify any confusion rather than soldiering through, there are no stupid questions.